PROFINET network configuration S7-1200 PLC AC / DC / Rly in agribusiness. 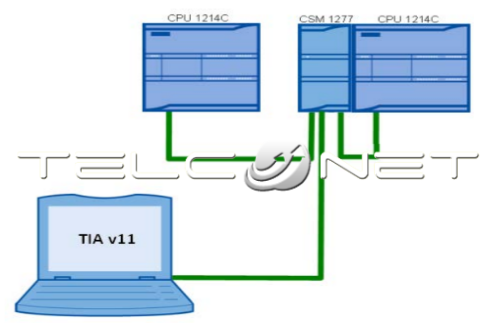 PROFINET network is integrated to share from an S7-1200 PLC different analog variables that govern one second S7-1200 PLC solution integrates a CSM 1277 Ethernet Switch and programming TSEND_C and TRCV_C necessary for bidirectional communication between the CPU. Solution incorporates the change panel KTP600 PN control and hardware modification by further restructuring of PROFINET network. The S7-1200 controller provides the flexibility and power needed to control a variety of devices for different automation needs. Thanks to its compact design, flexible configuration, and powerful instruction set, the S7-1200 is suitable for controlling a wide variety of applications. The CPU incorporates a microprocessor, integrated power supply, input and output circuits, integrated PROFINET, E / S motion control and high-speed embedded analog inputs, all in a compact housing to create a powerful controller. Once the program is loaded into the CPU, it contains the logic required to monitor and control devices application. The CPU monitors the inputs and changes the status of outputs according to the logic of the program.